If Get Out wasn’t enough to convince you that Jordan Peele has a brilliant eye for horror, his latest production, Us, firmly solidifies him among the greatest of directors. His new film is brimming with brilliant staging, clever design, and a level of snark that always keeps the audience engaged in the film’s strange and disturbing nature. There’s a certain playful energy to Us, which functions as an intricate story worth deciphering in its many allegories and assemblies as well as a real thrill of a slasher chase flick. Where Get Out slowly builds an unease that gets under your skin, Us goes hard fast. Lupita Nyong’o plays Adelaide Wilson, a woman most disturbed from childhood trauma in the 1980s. Now an adult, she tries to go along with her family for a summer vacation at the beach—and it’s fairly easy to get along with her high-energy husband, Gabe (Winston Duke); their relatively aloof daughter, Zora (Shahadi Wright Joseph); and their slick-talking son, Jason (Evan Alex), who’s always wearing a mask. But Adelaide still can’t shake the fear that comes bubbling to the surface, terrified of facing a very familiar evil. It turns out she’s right to be scared when a creepy-looking family turns up at the Wilsons’ vacation home. It isn’t long before the family members find themselves defending their lives from these strange people, who look just like them. Also tagging along for the ride are a feuding-amid-smirks couple, Josh (Tim Heidecker) and Kitty (Elisabeth Moss), who add an extra layer of comedy with their bitterness behind smiles. Peele’s script always seems to have a consistent tone throughout. We start with a traumatic scene at a beach, and that terror continues. We get to know and like Adelaide’s family well enough that their love and banter carry on even when things turn dark and bloody. There’s a knowing nature in the way this believable and amusing family unit is crafted, such that the transition from group vacation to horrifying survival is seamless. One moment they could be fighting off vicious killers that want to cut them up with scissors, the next they’re arguing about going the route of Home Alone to defend themselves. But Peele keeps the comedy just enough in check so we’re always in the moment and paying attention. The mystery of who these unusual killers are is an intriguing one, and it leads down some very unique paths dotted with subtle visual clues. The story is ultimately one of identity and nostalgia with a grander focus on the social climate of our country—but with a clever delivery of its message that never outright spoon-feeds the information. A perfect example can be seen in the presence of the Bible verse Jeremiah 11:11. Despite references to it, none of the characters will outright read this verse, leaving it up to the most curious of unfamiliar filmgoers to look it up for forming theories. Even the verse itself is slightly vague. There’s been a lot of talk about the phenomenon of Jordan Peele being the next big director akin to Spielberg or Hitchcock, but he’s done an ample job making his films his own. He’s building an iconography with the way he features shots of his leads with big, bloodshot, frightened eyes. Lupita Nyong’o fills that role this time, and she has just the perfect expression to convey a true sense of terror when being attacked and viciousness when attacking back. Her performance is also a very calculated one, and her best scene in the third act is a very tricky climax to stage. Speaking of staging, Peele’s cinematography is absolutely engrossing—everything from a summer day at the beach to a dangerous trek through a long hallway filled with rabbits has a lingering element of the horrific. I suppose one reason many are comparing Peele to the likes of older directors is that he’s juggling a number of different horror elements that almost seem classic by modern standards: his use of an uneasy violin when the home is assaulted has an old-fashioned creepiness, and one particular close-up has a certain Brian De Palma vibe. But make no mistake. Us is certainly no throwback picture, weaving a blend of comedy, horror, and commentary that’s new and all its own. If it does seem familiar, it’s because Peele is challenging the audience with a picture that begs to be dissected and processed in even more depth than Get Out but with the same amount of importance worth talking about. 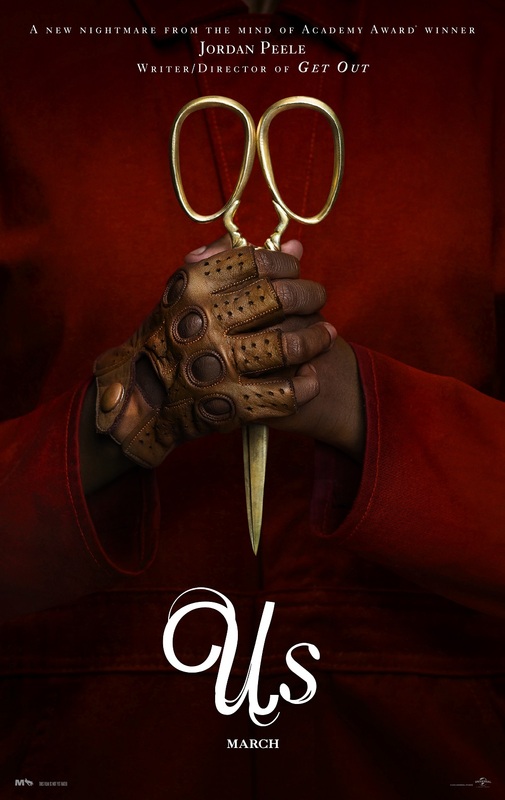 Us is not just another strong Jordan Peele horror production that has a brilliant balance of the comedic and creepy. It is sure to go down as a film worth multiple rewatches to catch every visual cue and extract every social message. Throwback Thursday: How Would a Close Encounter Affect You?